Well over half the world’s undernourished people live in the Asia-Pacific region, making it a critical part of the global push to end extreme hunger and malnutrition in line with the Sustainable Development Goal (SDGs), cautioned a new United Nations report on Friday [2 November 2018]. Bart Verweij/World Bank | Through a national school feeding program in Oudomxay province, Lao PDR, students get at least a third of their daily energy and nutrition needs. Seen here, a student enjoys her vegetables. | Photo from UN News. Hong Kong, 29 October 2018 – Groundbreaking analysis of new satellite data from 1 June to 31 August this year reveals the world’s largest NO2 air pollution hotspots across six continents in the most detail to date, and points the finger at coal and transport as the two principal sources of emissions. NO2 is a dangerous pollutant in and of itself and also contributes to the formation of PM2.5 and ozone, two of the most dangerous forms of air pollution. In the EU alone, cleaning up NO2 pollution could save up to 75,000 lives per year. 30 October 2018 –It is still too early to call Jair Bolsonaro president, because this election was the biggest farce in Brazilian history, starting with the mountain of irregularities in electoral propaganda, which has not yet been evaluated by the TSE (Superior Electoral Tribunal). The TSE has to explain to the Brazilian population why it did not annul Bolsonaro’s formula, after the denunciations about the gigantic fraud committed in the electoral propaganda of the first round of the presidential elections, in addition to the evident abuse of power and the favoritism that the military candidate received from evangelical media such as Red Record. 1 November 2018 – In a move described as a landmark decision, the Group of Earth Observations (GEO) – a UN-backed partnership set up to improve Earth observation data-sharing and availability, to benefit all life – has launched a global initiative to reverse the “existential crisis” created by desertification and land degradation. FAO/Giulio Napolitano | Herders take their animals to drink water in Niger. The key thrust of the initiative will see so-called “quality data” transferred into the hands of national and local decision-makers, where it can be used more effectively on the ground. We live in a world where malnutrition and death from preventable disease are routine. Destroyed habitats force massive displacement of people and destruction of other species. People work for wages insufficient to feed and house their families or to maintain a sense of security, dignity or belonging. Water and air are seriously toxic and “successful” lifestyles depend upon exploitation of people and planet. Elections are bought. Human trafficking, massive incarceration and endless wars stifle the aspirations of those most severely displaced and denigrated. These wars have come close to the ultimate catastrophe of nuclear war ending the continuation of life on this planet. 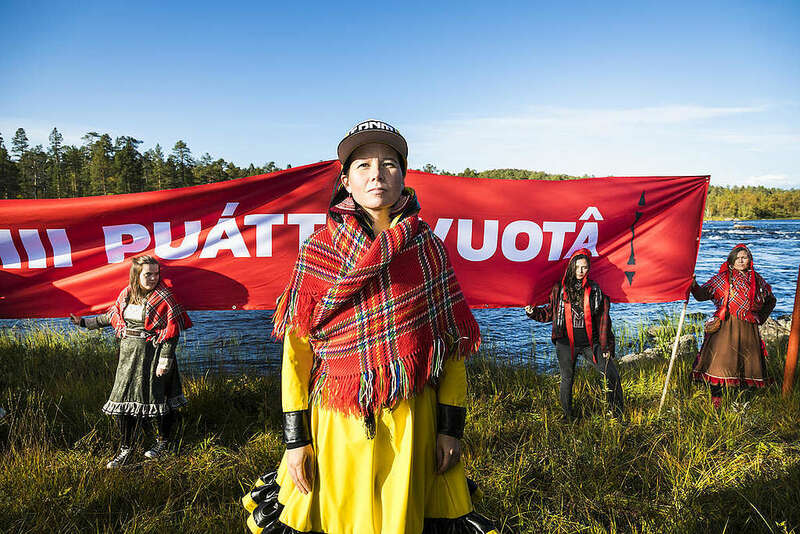 31 October 2018 (Greenpeace)* — I come from the far north, a beautiful land called Sápmi where my people, the Sámi have been living in our traditional territory for thousands of years. Our Indigenous territory encompasses the northern part of Norway, Sweden, Finland and Northwest Russia. I am the daughter of all those who came before me and I am following the paths my ancestors created for me. 1 November 2018 — The killing of journalists around the world for doing their job is “outrageous” and should not become the “new normal” according to UN Secretary-General António Guterres. In just over a decade, some 1,010 journalists have been killed for reporting the news, and in nine out of 10 cases, the perpetrators are never brought to justice. In 2018 alone, at least 88 journalists have been killed according to the UN. UNESCO | Between 2006-2017 over 1,000 journalists were killed for reporting the news and bringing information to the public. Many thousands more have been “attacked, harassed, detained or imprisoned on spurious charges, without due process,” Guterres said in a video message for The International Day to End Impunity for Crimes Against Journalists, marked annually on 2 November. The critical difficulties in accessing food in Yemen, and other hardships caused by the ongoing conflict, could lead to the world’s worst famine ever, and place up to two million malnourished, pregnant and lactating women at risk of death, the UN sexual and reproductive health agency, UNFPA, said on Thursday [1 November 2018]. UN OCHA/Giles Clarke | Four months-old Saleh, admitted in Al Hudaydah’s main hospital in April 2017, and his mother Nora. Close to half a million children and two million mothers in Yemen are at risk of dying from severe acute malnutrition due to ongoing conflict.